Alice Knight’s Urn of Flowers with Scene from Ballet Swan Lake. Reverse painting and foil on glass, c. 1940. Source: AFAM, gift of Susan and Laurence Lerner. Before the Internet, Etsy, TV, and mass media, creative women used foil as a flashy additive to reverse-glass paintings that decorated pre-electric homes. The American Folk Art Museum has seen fit to honor this delightful pastime in Foiled: Tinsel Painting in America. There’s a prequel to the show focusing on reverse-glass painting to the left of the main gallery that’s chock full of examples of the glimmering media from dozens of anonymous women artists who decorated homes, shops, and gaming tables with the shimmery stuff. 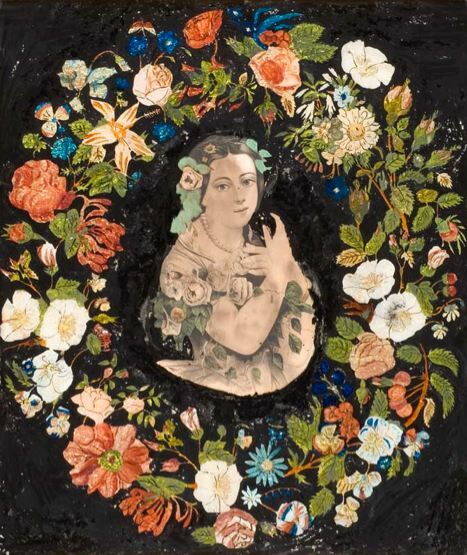 Tinsel painting isn’t seen much today, since it’s so fragile, but when Alice Knight (one of the few known tinsel artists) came of age in the 1880s, she would have seen creations like this tribute to Jenny Lind. In the 1920s, Abby Aldrich Rockefeller acquired some for her folk art collection now enshrined in Colonial Williamsburg. Artist unknown. Wreath of Flowers with Lithograph of Jenny Lind. 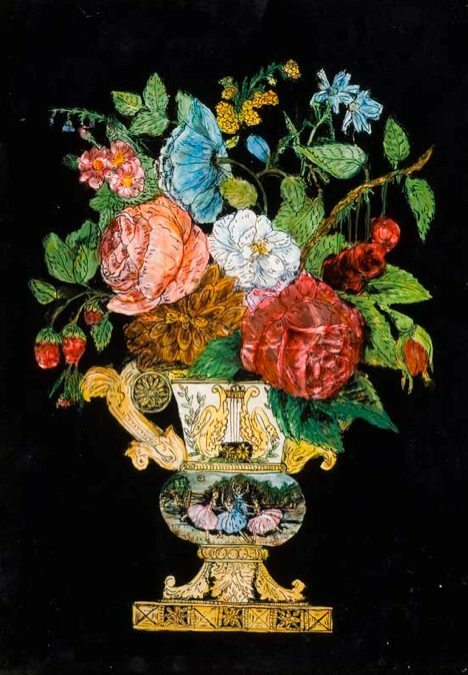 Reverse painting and foil on glass with lithograph, c. 1850. Source: AFAM, gift of Susan and Laurence Lerner. By 1930, tinsel painting (also known as oriental, crystal, or pearl painting) made its art-world debut in a show at the Newark Museum. Eventually, even New York souvenirs were sporting a little bit of the flash. Alice, who lived past 100 and created works even then, would have loved Etsy. This entry was posted in Art, History, Museums and tagged arts, culture, history, museums by mssusanb. Bookmark the permalink.